Sally: who knows, maybe we could have had an affair before you met Iris. 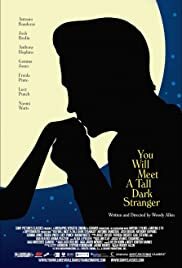 You Will Meet a Tall Dark Stranger (2010) was written and directed by Woody Allen. Even if you didn't know that, you could guess it pretty quickly. In Woody Allen country, nobody stays in a love relationship if someone better comes along. Alfie Shebritch (Anthony Hopkins) is an older man married to Helena (Gemma Jones). He decides to have a (somewhat late) midlife crisis, finds a bimbo, and leaves his wife. Meanwhile, their daughter, Sally Channing (Naomi Watts) is leaving her husband Roy (Josh Brolin) because she has fallen in love with Greg (Antonio Banderas). Meanwhile, Roy . . .
Allen has the clout to surround himself with these fine actors, and his movies--including this one--demonstrate his complete command of the medium. The problem is that he's writing and directing the same romantic comedy over and over. I saw the movie on DVD and it worked well on the small screen. I think it's worth seeing if you're in the mood for fine actors in a lightweight comedy. If you're in the mood for more than this, find another film.